Brač is the largest Dalmatian island. It is about 40 km long and an average width of 12 km. With a total area of 395 km 2 is the third largest island in the Adriatic. The sunniest Adriatic area with over 2,700 hours of sunshine a year and the summer 9-12, in winter over four hours a day. The average summer temperature is 23.8 C and 8.6 C in winter is characterized by all the typical Mediterranean features: long, hot and dry summers and short, mild winters. On Brač are now 22 villages and 12 settlements and 5 abandoned hamlets. Brač is very well connected to the mainland, and the whole of Europe. All coastal sites on island are connected with Split by daily ferry connections (ferries, catamarans), and ferry traffic Split - Supetar and Makarska - Sumartin several times a day. Brač is also associated with aircraft Zagreb and Split, the airport receives aircraft from all parts of Europe. Today is considered that Brač is an ancient Illyrian name of one of the noblest animal – deer (in Illyrian Brento, in Greek Elephos) so Brač in history was recorded as Brentis or Elaphusa. Brač is really an ideal island for enjoying in beaches and beautiful coastline. Countless are hidden inlets dispersed along the whole island which with their natural features and clean sea attract bathers from around the world. Along the cattle breeding, fishing, olives and vines, one of the major activities in the island's is stone carving. With Brač stone were built numerous buildings; in ancient times, Diocletian's Palace in Split, and in more recent years, the White House in Washington. Škrip is the oldest settlement on the island. It is a monument in witch their ethnic layers have deposited the Illyrians, the Romans and the Croatians, as the evidence of their presence. There are numerous monuments in it like the castle of Cerinić, a Roman temple, a few sarcophagi, a mausoleum from the 3rd century, built on Illyrian stone walls, the tower of Radojkvić, the cemetery with the ancient Chapel of the Holy Spirit, the parish church of St.Helena with the most harmonious baroque facade on Brač, the nunnery of St.Anthony and the Regional Museum with a rich collection of stone consisting of Roman, late antiquity and early medieval monuments and sculptures. There is a stone "delicacy" formed like a cake near Nerežišća. Walk under it and make a wish. to the monastic life of the Glagolitic friars in the 15th century. the moon and the Madonna. Vidova gora (the Vidova Mountain) is the highest mountain peak of the Adriatic islands, 778m above sea level. 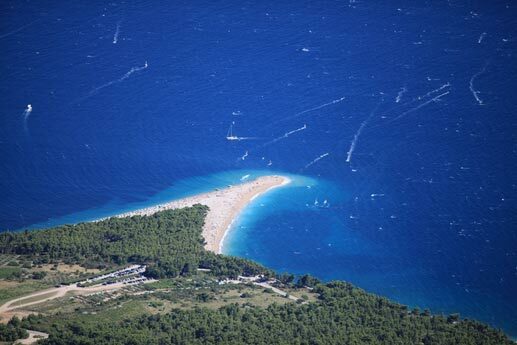 as well as the famous and the most beautiful beach in Dalmatia, the Golden Cape. On the way to Vidova gora you will be amazed by various sorts of the black pine and the scent of medical herbs. The hermitage of Blaca is a beautiful monastery chiselled in a cliff from the 16th century. a collection of watches, a rich collection of ancient weapons, a small printingroom, school which was active till 1963. To sum it up, Blaca is a first class historical monument well worth seeing. Walking and gourmet trail "Dolčevita"